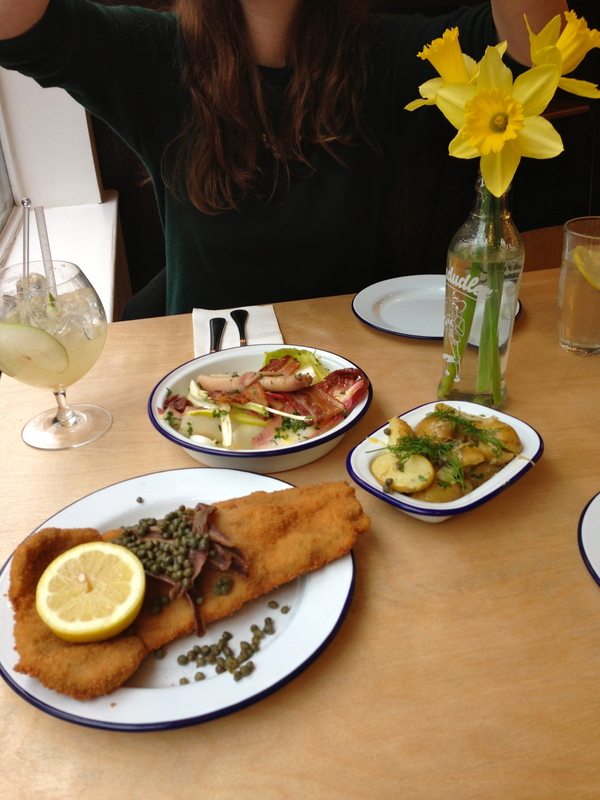 Boopshi’s Schnitzel & Spritz is a little Austrian gem tucked away in the backstreets of Fitzrovia, owned by brothers Ed & Ben. Because you’re so clever, you’ve worked out that their menu consists of schnitzel (beaten, breaded and fried meat) and spritzers (prosecco cocktails). The menu, inspired by the brothers’ Austrian grandparents, is incredibly simple. There are three options of schnitzel, rose veal, chicken and rare breed pork. Your choice can then be topped with duck or hen egg, anchovies and capers. It also features a few classic dishes and sides, each with a modern twist. As we complained about the steady downpour and ominous clouds, reminiscing over outside dining at LA’s finest and late night dessert dates, our feast arrived. Let the food blogging commence! It’s always nice to dine with a fellow foodie that doesn’t mind my snap happy moments before digging in. Upon recommendation from Rose, writer of the The Londoner, we went for the rare breed pork schnitzel. We chose capers and anchovies to top it off and enjoyed an incredible combination of sweet, tender meat with saltiness from the toppings, and a nice squeeze of acidity to tie it all together. Although schnitzel isn’t something I’ve often eaten outside of the kitchen, I feel confident in saying this has to be the best in London. 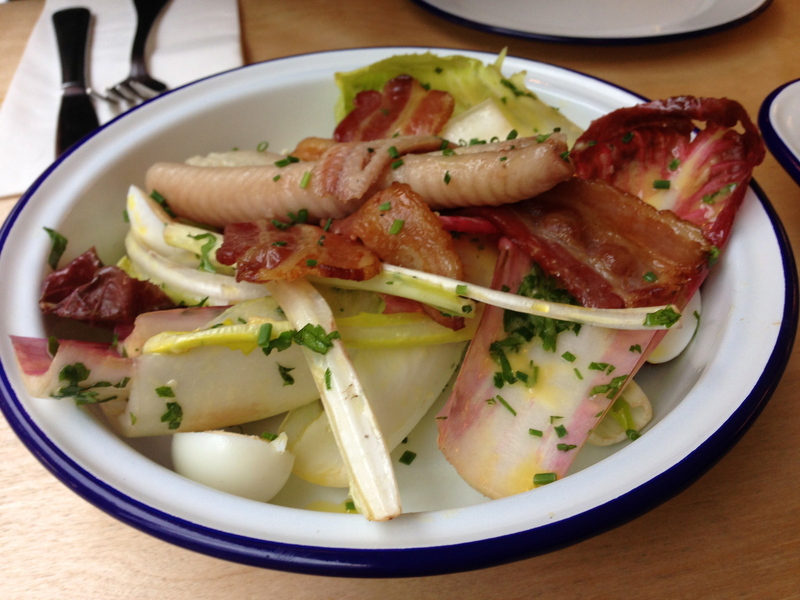 We moved on to try the smoked eel with bitter leaves, bacon and quails egg, another recommendation from London foodie Wilkes, writer of Wilkes888. 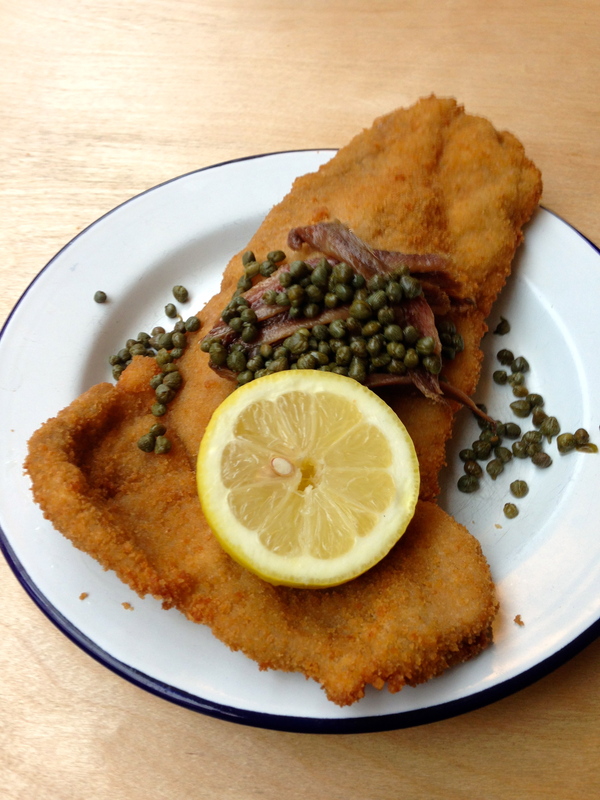 A simple dish with vibrant, salty and bitter flavours which perfectly accompanied our schnitzel. 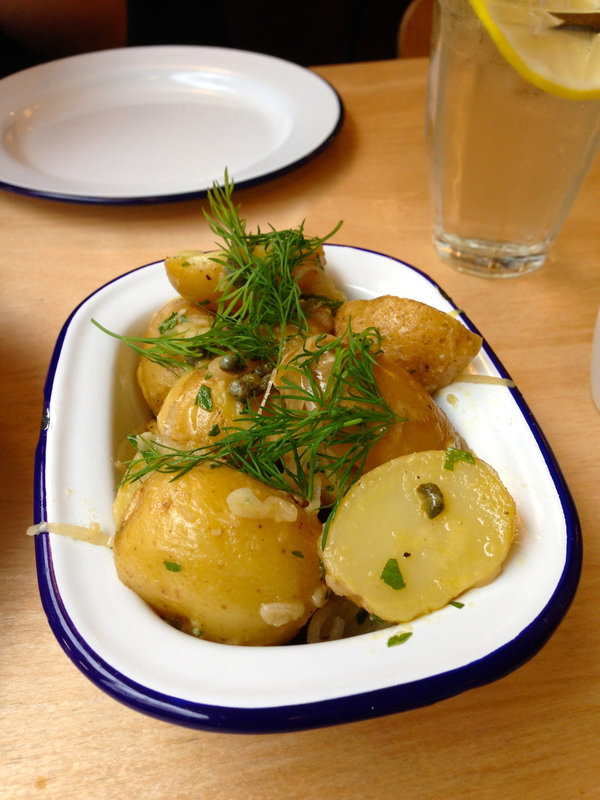 A side order of potato salad doesn’t seem particularly inspiring, but damn were these done well. The underlying theme of their menu is clearly using simple ingredients with pops of flavour to bring out the best in each dish. Until we got to dessert. 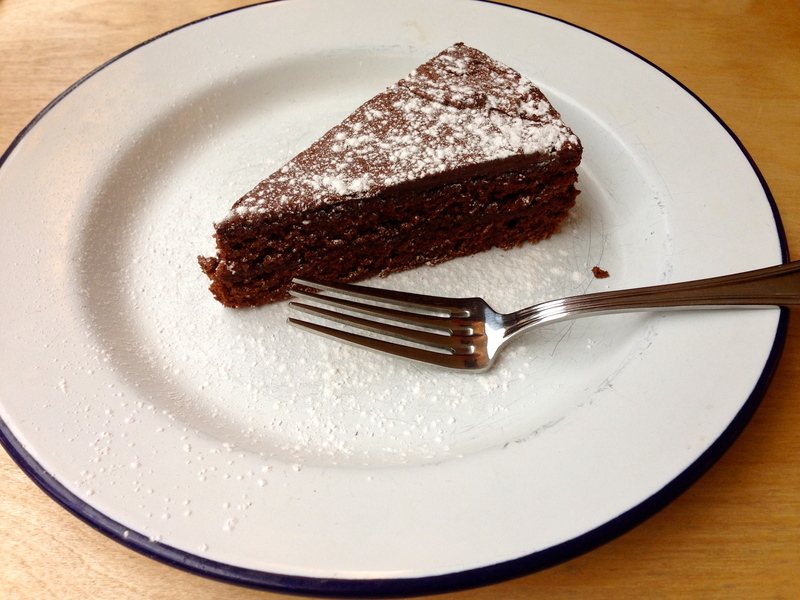 We decided on the Sachertorte, a Viennese classic chocolate cake with apricot jam and a silky chocolate frosting. 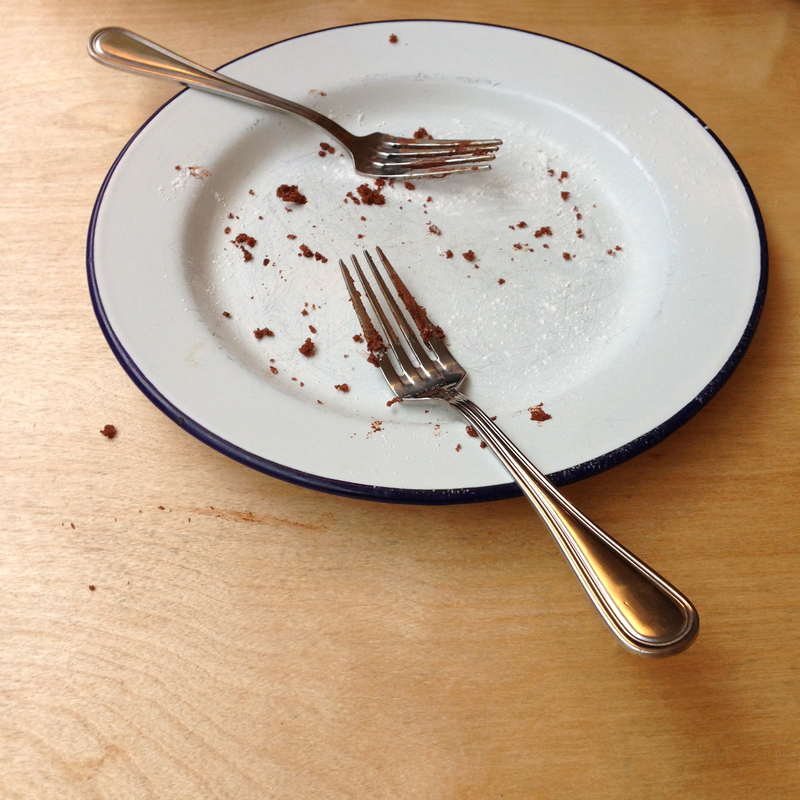 What arrived was a dry slice of chocolate cake. It had good flavour, but was quite dry and a big pour of vanilla custard or a piled scoop of ice cream wouldn’t have gone amiss. (greedy, I know) I also think £6 for a piece of cake is a bit steep for a reasonably priced menu. Nonetheless, we heroically managed to consume it all! I was pleasantly surprised by the food at Boopshi’s. There’s a light and airy little dining room upstairs, and a darker, larger dining area & bar down below. The spritzers are said to be great, again with a menu that’s short & sweet. 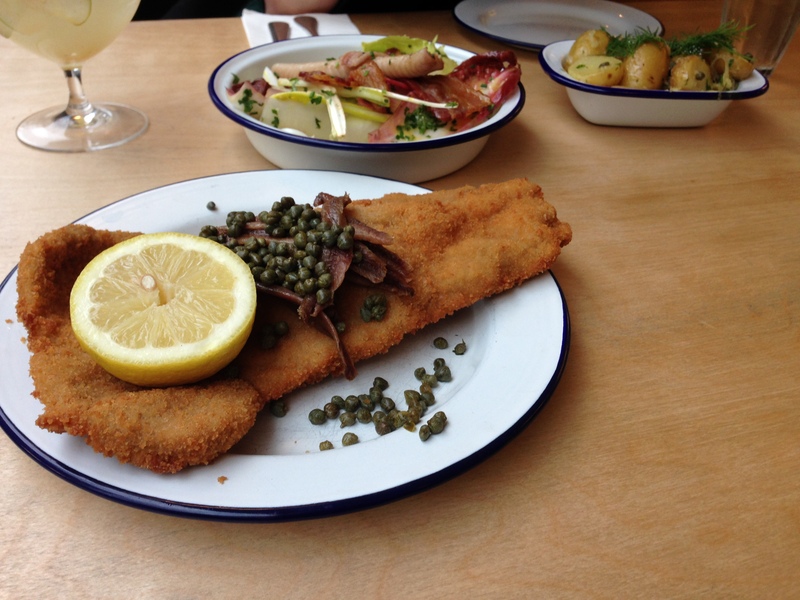 It’s perfect for lunch if you’re in the area, a laid back dinner date, or to satisfy any schnitzel craving.